I've never been one to seek out skinny versions of my favorite recipes, but I recently found myself with a big bag of whole wheat flour (when did I buy it??) and wanted to put it to good use. Since I'm sort of deeply into pumpkin right now (see here) I decided skinny pumpkin muffins were in order. 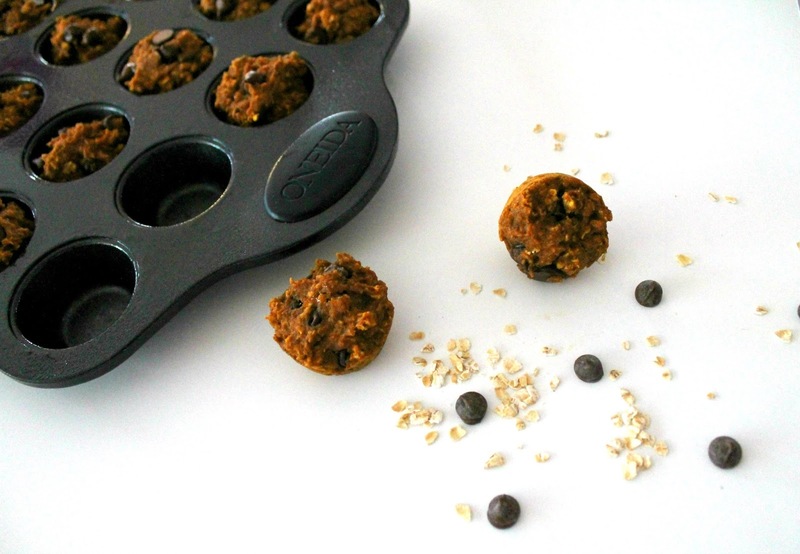 This recipe uses a mix of whole wheat flour and oats, and calls for less sugar and oil than most pumpkin chocolate chip muffin recipes, but the results are still just as addictive. And they're even better the next day with coffee! Preheat oven to 375° and line mini muffin tin with paper cups, or spray with baking spray. Whisk all dry ingredients and spices together in a large bowl. In a separate bowl combine pumpkin, oil, milk and eggs and mix well. Add wet ingredients to dry ingredients and mix, then add chocolate chips and stir. Spoon batter into muffin cups and bake for 10 minutes. Must try this recipe. You've got some great ones on your blog.